We recently had the pleasure of working with the talents of Erika Layne of Erika Layne Photography & Design and Cayce Carlisle of Little Miss Whoopie, the collaboration took us to new heights. In the studio, we created a funky new look for a Little Miss Whoopie multi-media brand boost. Take a look at what we've crafted together. We took a moment to dig deeper and chat about what drives and inspires these two powerhouses. is a visionary behind the lens with a longstanding passion for photography and art. Photo by of Erika Layne. Soul & ink teamed up with @bigupstickups for these fresh 4" round glossy slaps! 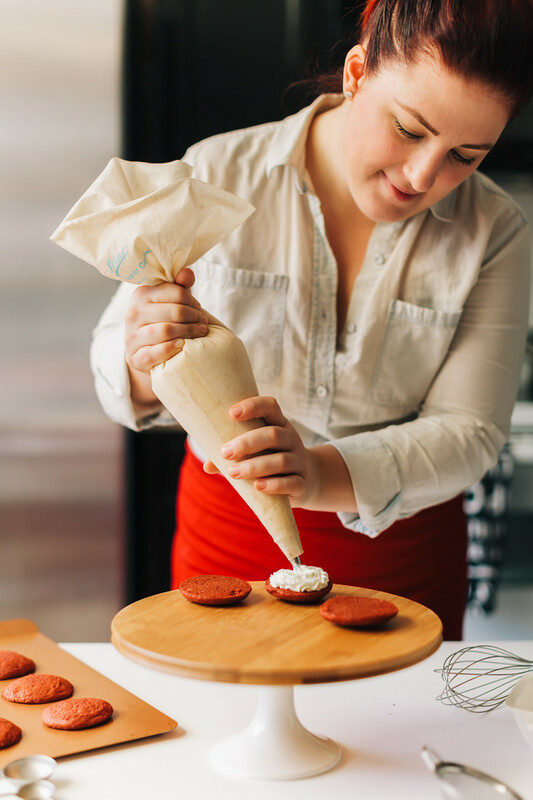 the baker and founder of Little Miss Whoopie walking in her mother's footsteps. Photo by Erika Layne. We developed a comic noir style illustration to bring a Mister Whoopie superhero concept to life. 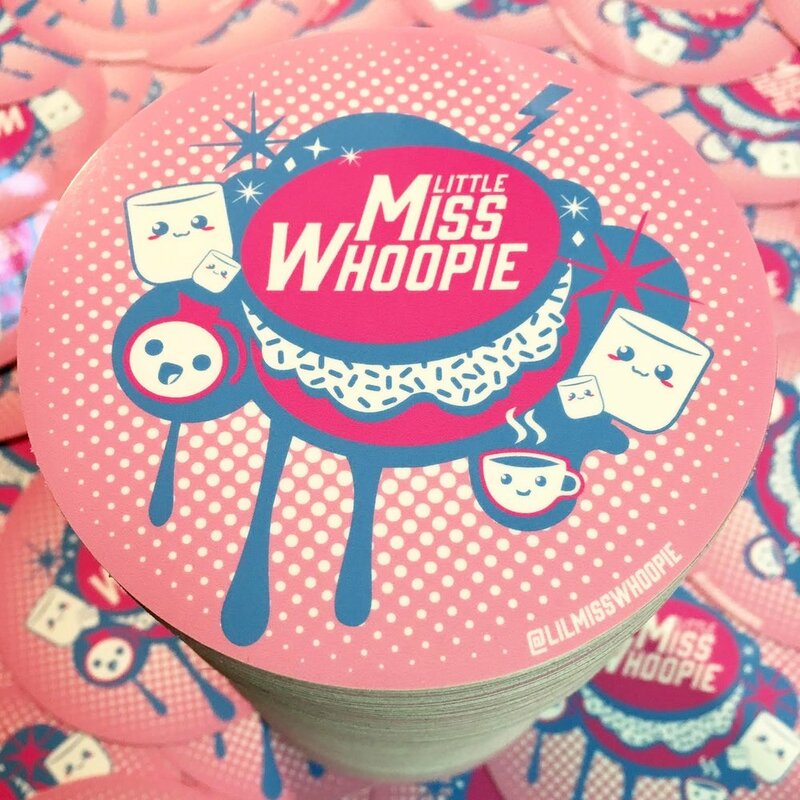 Little Miss Whoopie reached out to us for a vibrant new look for special giveaways, so we created this kawaii inspired design, with halftones for a comic book feel. S&I: What compelled you to start your own small business? Erika Layne: I was a teacher for 7 years, and although I enjoyed connecting with high school students on a creative level and watching them expand their minds, I felt the itch to be doing what I loved myself while I was still young and had the energy. I started forming my business while being a full-time teacher and growing my family. After a while, I felt I was being spread too thin, and after three years of transitioning to a part-time teaching schedule and building my business on the side, I was able to match my incomes. I thought to myself, it's now or never, because there is probably never going to be a "good" time to quite receiving a consistent paycheck. Cayce Carlisle: From the time I was old enough to work, I knew I wanted to work for myself. I come from an entrepreneurial family and always loved the idea of not only being in control but also being able to be creative. I love baking and creating sweets, and knew I would open my own bakery or coffee shop. It was always in the back of my mind, every time I went to get coffee or went to a bakery, I would take notes on what I liked and didn't like. I have been planning to open my own bakery for over ten years. I think when you have a passion for starting your own business, it becomes all consuming. When the opportunity came that I was able to start my own bakery, we couldn't decide on a neighborhood to open in. This brought about the food truck concept, and Little Miss Whoopie was born! S&I: What is your creative process like? EL: I try to follow my heart as best I can. With social media, it's hard not to get caught up in what other people are doing and you may even start to slip and think you should be doing it their way, but that couldn't be further from the truth. To get back to myself, I have learned to spend time with myself and my journal. My goal is to not be afraid to make mistakes or look ridiculous because that impedes creativity. CC: It's constant. It's happening 24/7. I get ideas from everything! I'm always carrying my notebook around to write down ideas. S&I: What advise do you have for any one aspiring to start their own? EL: Just start!! It's a learn on the job experience. It is nearly impossible to have all your ducks in a row before labeling yourself a business owner. So go ahead and make moves everyday if this is something you want to do. Try it out on your friends and family, then expand from there. And always work on your craft. CC: Make notes. Figure out your strengths and opportunities and find someone that's your opposite. Understand that you're going to have some really tough days, but you're also going to have amazing breakthroughs. If you're driven enough to want your own business, you're tough enough to make it successful. Don't be too hard on yourself, making the decision to start your own business is a brave commitment. I would also say that you are the only one who has your vision, you are the only one with the passion to make it work! Your dreams won't work if you don't! S&I: Who or what inspires you? EL: I have learned that it's ok to mix totally unrelated areas of my life to create something magical. I love watching how people interact with each other, and plants bring an immeasurable amount of joy to my life. So whenever I can, I merge the two. CC: My mom inspired me to want to open my own baking business. She had a successful restaurant, two bakeries and a deli. She went on to become an amazing personal chef and ran her catering company. I grew up helping her and it created this fire in me to match her success. She's taught me everything I know, she's the reason I know how to bake! I'm also inspired by being able to make people happy. When people compliment my brand, my product, it's really gratifying that someone appreciates all of the work I've put in. S&I: Can you share a bit about your experience working together with Soul & Ink? EL: There is a huge growing creative community in DC, and whenever I collaborate with Soul & Ink, I feel apart of it. They fully trust me to capture the spirit of the events they are a part of and being around such creative and good spirited people creates the perfect soul for any creative to grow. CC: Can you share a bit about your experience working together with Soul & Ink? It's been amazing! Great creative process, open communication, committed to our brand. Business is about people, and you are wonderful to work with. Supportive, understanding and immensely talented! You taught me how to be more concrete in what I wanted for my brand, and how to better communicate about our design! S&I: Thank you, ladies. Much love and success to you both.